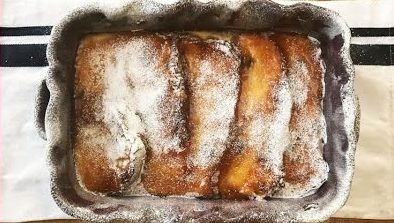 Our super easy Panettone Bread & Butter Pudding is great for using up any excess Christmas panettone and makes a posh version of the British classic. GREASE a 30cm x 20cm ovenproof dish with a little butter. MIX together in a bowl the eggs milk and sugar. CUT the panettone into 1.5cm slices and then butter them. POUR the egg mixture over the panettone using a sieve. COOK for 1 hour until set. WARM the jam and spread thinly over the pudding.